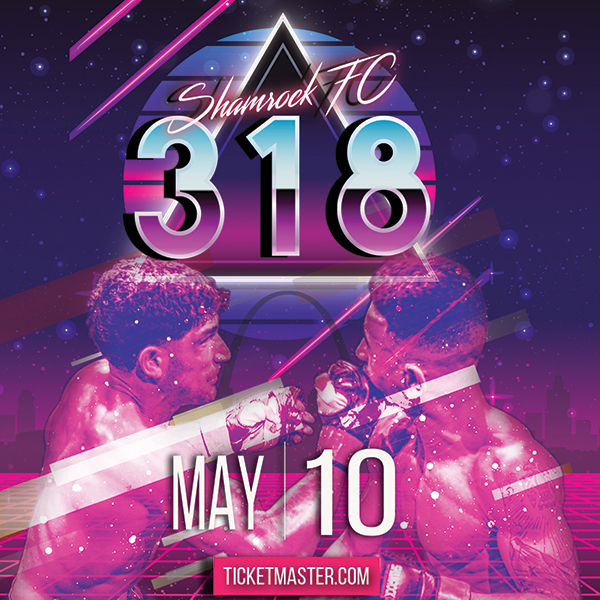 Shamrock FC 290 at the River City Casino Friday night was spiked with shock and awe. In the main event, Chel Erwin-Davis pulled off a submission victory over Adam Meredith late in the first round. The win improved Erwin-Davis to 5-0 and for Meredith it was his second straight loss. Meredith – the 2015 Regional Pro of the Year – took to social media post-fight and indicated that he may be heading into retirement. "There is a lot of talk saying i'm the ghost in the game here, especially since I'm from upstate New York." Erwin-Davis said. "I came back here to trying make a name for myself. Had a long layoff, my last fight I won, was supposed to fight in December but I got hurt. Right now I'm just trying to stay healthy and get more consistent so I can stop being the ghost and start making a name for myself." The pair locked up in the clinch early in the first round. Erwin-Davis (5-1) scored a nice trip that landed him in Meredith's (5-3) butterfly guard. The spindly welterweights were laced up on the ground before Meredith scored a nice omoplata sweep. "I've been training a lot of situations on the ground." Erwin-Davis said. "I knew eventually whether it was on my behalf or on his behalf we would end up there, so I've been training a lot of reversals and submissions to make him think about my game rather than to implement his game when he was on top." Erwin-Davis locked down Meredith's posture and went for the finish. He tried a triangle, converted to an arm bar and back to the triangle to get the finish late in the first round. 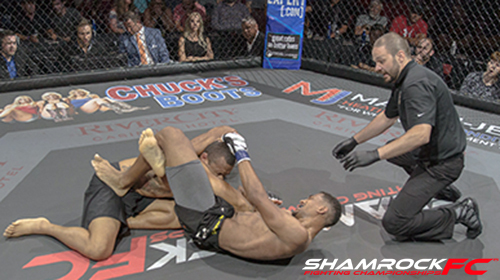 In the co-main event, Aaron Highfill, moonlighting for the second time at middleweight, registered a highlight reel TKO over Ty Flores early in the first hand with a massive overhand right followed by some ground and pound. Highfill is now 5-2, and 2-1 for the year. Speaking of former Regional Pro's of the Year, Rashard Lovelace earned that title in 2016. On Friday night Sean Woodson used a precise boxing game and a steely resolve to earn a 30-27, 29-28, 29-28 unanimous decision win, giving Lovelace (4-1)the first loss of his career. With a distinct height and reach advantage swaying his way, Woodson soldiered through a first round that saw Lovelace looking to chop away with leg kicks. “I knew he was going to hit hard but when I felt it I wasn't thinking it would be that hard and it was not his punches but his kicks,” Woodson said. “I knew he was a strong guy but his kicks were insanely powerful. Midway through the second round you could see the tide and the momentum of the fight sway Woodson's way as his accuracy improved and he partnered combinations that took its toll on Lovelace. The 24-year-old Woodson improves to 3-0. After a slow-paced first round, Garrett Gross got the offense going against Frank Sloan in the second round in a 160-pound catchweight. Gross caught Sloan with an early uppercut and nearly ended the fight. The fight got to the floor and Sloan found a little new life. Sloan managed a little offensive firepower but Gross drug him down. Slonn held a tough in guard but Gross landed big shots late on a turtled up Sloan and the fight was stopped right at the end of second round. 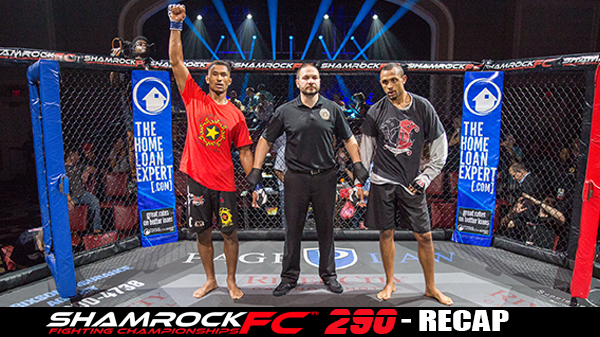 A true rivalry was established as Erion Zekthi earned an oddly-scored 29-28, 27-30, 29-28 split decision victory over Scott Ettling at bantamweight. The fight boiled down to Zekthi's ability to get the takedown any time he wanted and Ettling generating submission attempts from off his back, some more threatening than others, but Zekthi for the most part appearing to be out of harm's way for the whole three rounds. In the second round, Zekthi snagged a single leg and Ettling went back to his submission game. Zekthi was content hanging out in either side control or in Ettling's guard and mixing in shots to the body all the meanwhile, Ettling was searching for a submission but Zekthi's submission defense was not having it. Ettling started to elbow from the bottom and toward the end of the round the two slugged it out on the ground with a late spurt by Ettling. The third round was more of the same with Zekthi dominating with the takedown. The pair traded positions with neither doing much damage or threatening the other. Dan Busch got a 'W' back in the column with a finish of Jason Smith to start the main card. Smith landed wild left to start the second round and beat up Busch some on the floor. He made his way to side control and searched out a submission. Smith made it to mount near the 3:23 mark. Busch gave up his back and Smith put in his hooks and went for a choke. Busch fought the hands briefly before he spun out, made his way into Smith's guard and rained punches in. It was then Smith's turn to give up the back near the 2:00 minute mark. Busch punched away and Smith did nothing to defend, giving the stoppage win to Busch at 3:10 in the second. In a wet-blanket first round, Smith smothered, cranked and squeezed for the bulk of the three minutes. In the closest, most well-matched fight of the all amateur undercard Colin Parr won a split decision over Jordan Meister. It was a feeling out process in first round with both trying to determine range and very little offensive output from either. In the second, Meister clipped him with an overhand and he fell into Parr's guard Parr tried submission attempt but Meister was able to keep him planted. Parr kept active on bottom, but a failed sweep attempt resulted in eating some punches from Meister, who clubbed away while in full guard, eventually opening Parr up over the eye. With the fight up for grab Parr was his most active on the feet as he had been all night. He stuffed a shot but Meister nice sweep put him in dominant position . The fight returned to the feet and Parr managed to end the round with flurry attempt. Ian Zarvos vs Chiavy Rith used held the speed and technique advantage. Early on in the first round he was able to send Zarvos to the canvas with chops to the legs. Zarvos did land a stiff right toward the end of the round and Rith sent him to the canvas again before the bell. Zarvos shook off several shots early in the second and as Rith tired, the style of the fight swayed Zarvos' way as the two stood in the center trading punches to end the round. The two got the biggest pop from the crowd up to that point in the third round with the constant trading. Nine seconds into the second round, Chuckie Brooks landed a right hand straight down the pipe to KO Freddy Kostjerevac. Kostjerevac was aggressive in the first round and put on a heavy pace. Staton Odell looked promising with his unanimous decision win over Bob Hinchcliffe. The two traded hard shots from the stand-up but Odell had more time in a dominant position when the fight went to the ground, earning him the nod from the judges. Jacob Longwell defeated Jermiah Vandergraph in a light heavyweight match-up. Two quick, explosive finished kicked off the undercard. First it was JR Roberts landing a big on Ben Wolf that put him face down on the canvas. Then Vince Hutchens got an impressive TKO over John Graves.